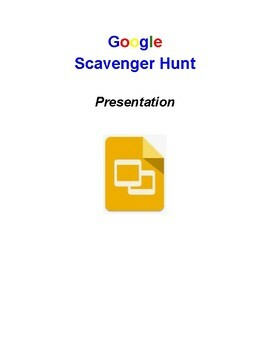 Students will have to follow a series of instructions to complete a scavenger hunt on Google Presentation. They are given enough hints within the instructions to work independently. 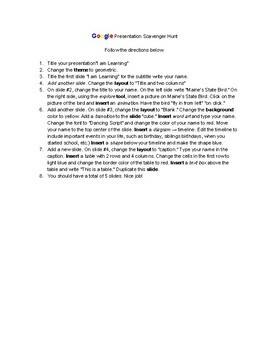 The goal is to have students explore the different features of Google Presentation: Changing the theme and layout, explore tool, insert images, animations, transitions, word art, diagrams, shapes, inserting tables and text boxes, changing font and color, adding slides, and duplicating slides. Answer keys is included on the last page.